If there is not enough room in your jaw for your wisdom teeth to erupt, they can cause pain, infection, and a variety of other dental problems. The teeth can erupt at the wrong angle or become trapped beneath the gum tissue. At the Center for Advanced Dentistry in Red Bank, NJ, we offer wisdom tooth extraction to protect your smile. In some cases, Dr. Michael J. Bixby may recommend removing wisdom teeth before they begin to cause issues. Wisdom teeth can cause a host of serious oral health issues when they become impacted. 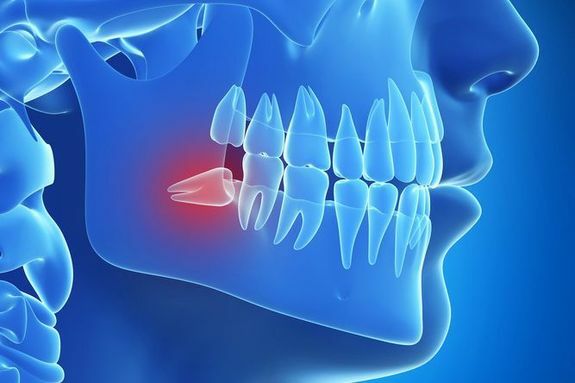 When they erupt at an angle, wisdom teeth can push neighboring teeth out of alignment. Meanwhile, the location of wisdom teeth makes them difficult to keep clean, making them especially susceptible to decay. Dr. Bixby can determine if your wisdom teeth require extraction during a consultation at our office. We can take x-rays of your jaw to examine the angle and location of your teeth. If you are already experiencing symptoms, or if Dr. Bixby identifies a potential concern with your third molars, he may recommend extraction. Wisdom tooth extraction is a short outpatient procedure which can protect the health of your smile. The specifics of your wisdom tooth removal procedure will depend on whether the teeth are impacted. Before the procedure, you will receive anesthesia and sedation to ensure your comfort. If your third molars are visible above the gum line, Dr. Bixby will use a special tool called a forcep to grasp the tooth and gently rock it back and forth to loosen it before extracting it. Impacted teeth require more complex measures involving incisions in the gums or bone tissue of the jaw. Once your teeth are removed, Dr. Bixby will place sutures if needed and pack the area with gauze to encourage healing. Dr. Bixby can provide you with more detailed instructions for what to expect after treatment. Wisdom tooth extraction is a short outpatient procedure which can protect the health of your smile. If you experiencing pain near your wisdom teeth, or if you are interested in discussing preventive wisdom tooth extraction for your child, contact our office online or call (732) 224-1160 to speak to a member of our team today.